Posted in Uncategorized on August 14, 2015 by admin. I was surprised when Cesar Cala, a fellow community organizer, complained that his efforts were often frustrated by “those GD activists.” “GD” I asked, “what are you talking about?” “The grim and determined,” he replied. Cesar is right. Too many of us take ourselves way too seriously. We give the impression that activism is our cross to bear. If that’s our attitude, who’s going to want to join us? 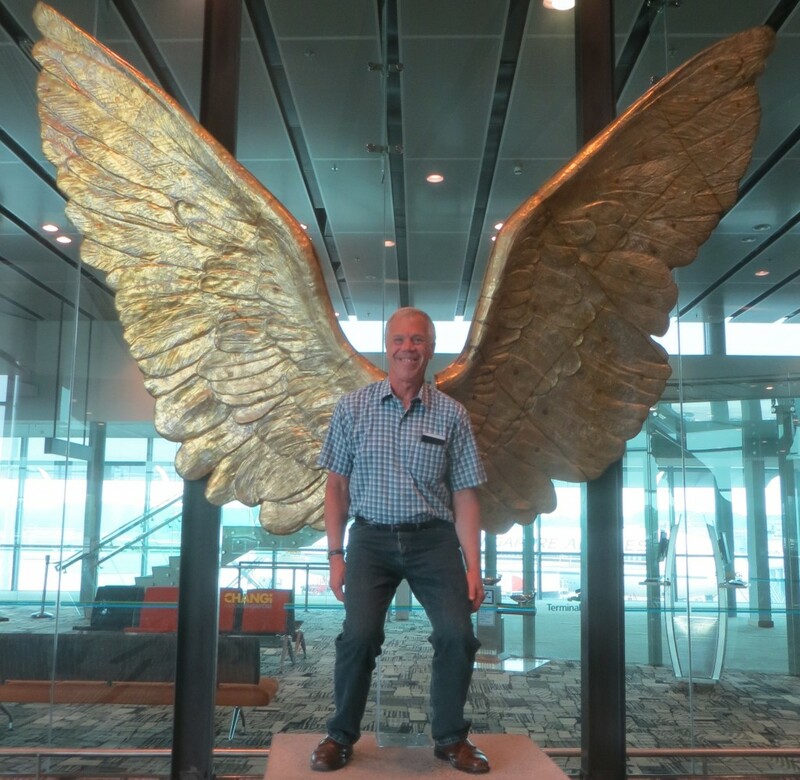 We need to lighten up and have fun if we want to make serious change. Recently, I was the guest of Peter Kenyon, of the Bank of IDEAS, who lives in the Western Australian city of Kalamunda. Clearly, Peter’s infectious, fun-loving spirit has caught on. Kalamunda’s activists know the power of humor. When the state government threatened to amalgamate Kalamunda with a neighboring city, the people didn’t spend a lot of time gathering signatures on petitions or testifying at public hearings. 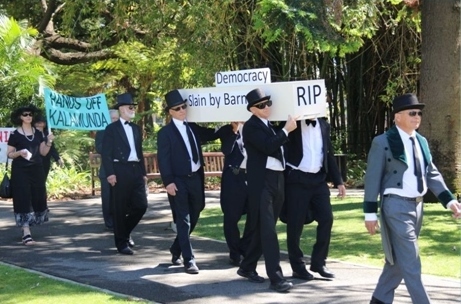 They organized a funeral procession mourning the death of democracy. Dressed in black and bearing a coffin, they paraded through the streets. The action generated media coverage like nothing else and contributed to the premier’s decision to back down. After all, who wants to be held responsible for the death of democracy? 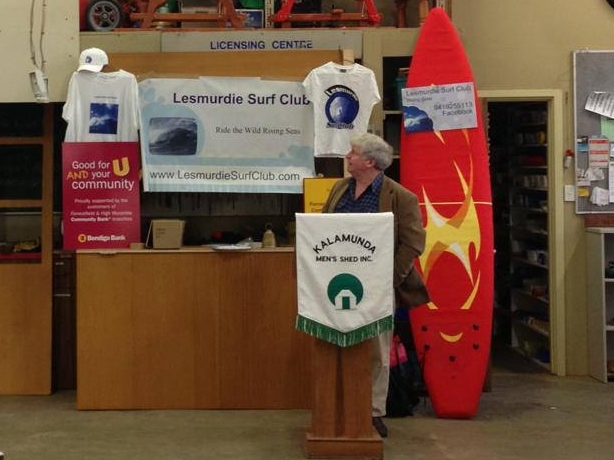 Kalamunda residents have also taken a light-hearted approach to the very serious issue of climate change. How do you draw attention to the melting polar ice caps and rising sea levels when you are in a city built on a hill 600 feet above and several miles away from the ocean? You prepare for the future by organizing a surf club. Jim Smith founded the surf club as a way to “raise awareness of the need for more sustainable living and to have some fun.” Now the surf club boasts membership from all over the world including the mayor of Miami Beach, Florida. Residents of Seattle’s Ballard neighborhood were equally creative in raising the issue of environmental sustainability. 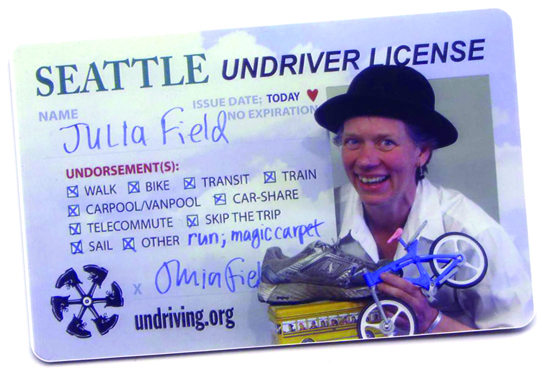 Working with Sustainable Ballard, Julia Field started issuing official-looking undriver licenses to those who pledged to use alternative transportation. 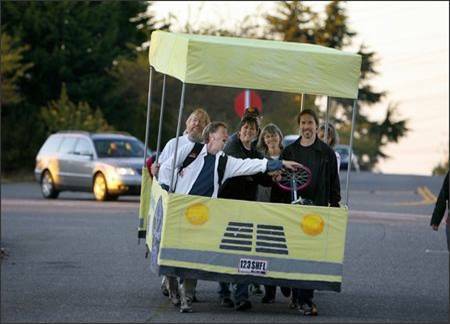 An undriver license entitles the bearer to board the shufflebus, a foot-powered, Fred Flinstone-type vehicle that gets passersby thinking about what they can do to reduce their carbon footprint. 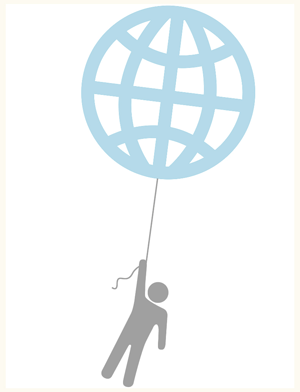 One of the best examples of creative activism is the Backbone Campaign based where I live on Vashon Island, Washington. 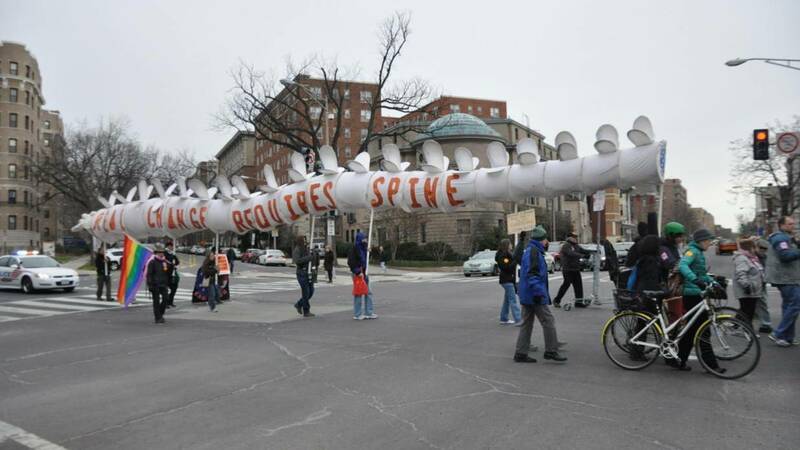 The organization is named for a 70-foot-long backbone puppet that it took to the Democratic National Convention and President Obama’s inauguration to encourage them to have the backbone to support progressive causes. When the Supreme Court ruled in favor of corporate personhood, the Backbone Campaign protested by unrolling a gigantic copy of the constitution down the building’s steps; the police didn’t know how to react because they didn’t want to mess with the constitution. 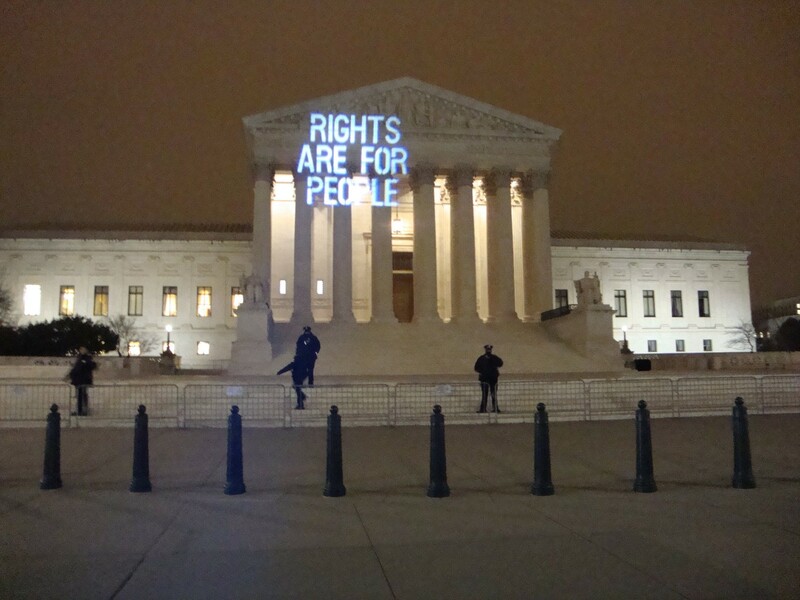 Later, the activists used a theater light to project dollar signs all over the side of the Supreme Court; again, there was nothing the police could do because no trespassing or vandalism had been involved. Every summer, the Backbone Campaign sponsors an artful action camp which includes training activists how to use kayaks for protests. Kayaktivists successfully shut down construction of a dock to be used for a gravel mine on Vashon Island and that property has now been converted into a large park. 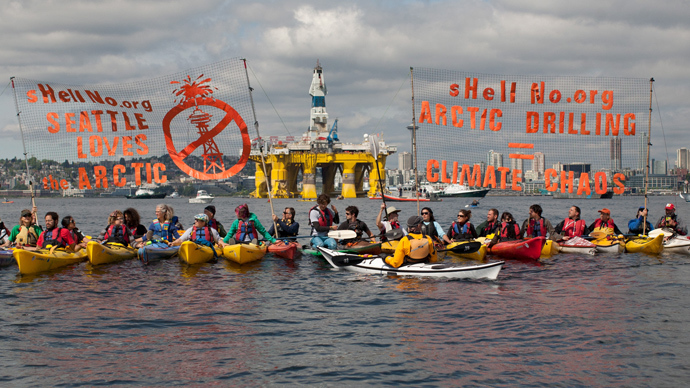 Kayakers trained by the Backbone Campaign are also playing a major role in disrupting Shell’s plans to drill for oil in the Arctic. In Surrey, British Columbia, residents faced the problem confronting communities everywhere – the loss of access to public space due to a misguided crime prevention strategy. 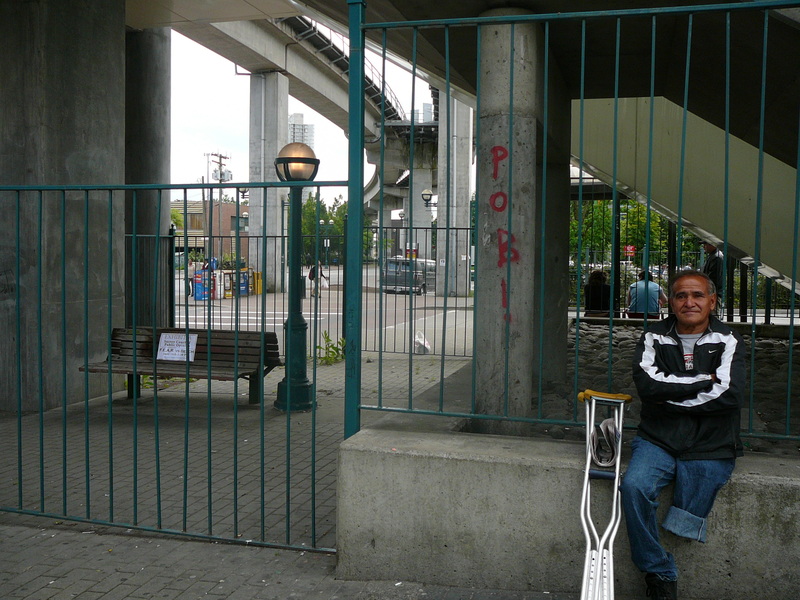 The bench beneath the SkyTrain station had been fenced off in order to keep the "wrong people" from using it. Of course, the fence meant that nobody had access. “How can you build community without bumping places?” the citizens wondered. 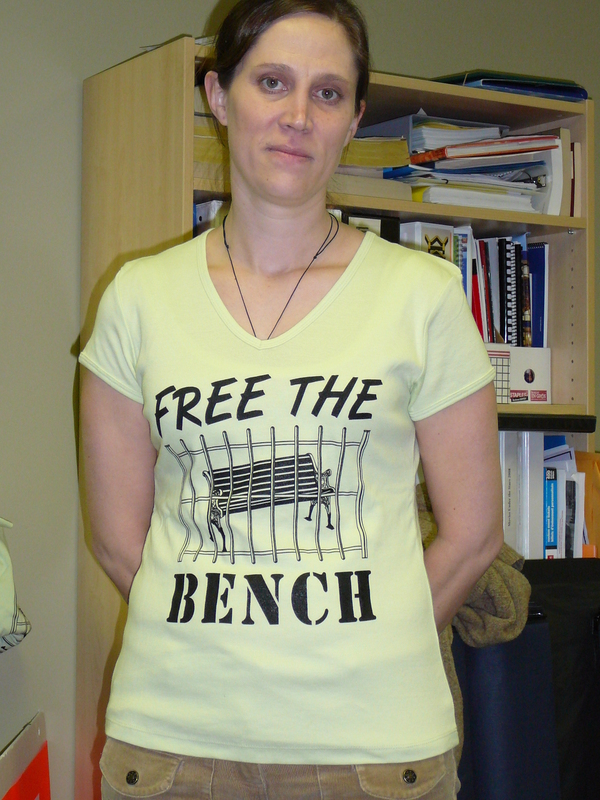 The community responded with a Free the Bench campaign. During the street fair in the adjacent business district, they used the performance stage to put the bench on trial. A local member of parliament served as the magistrate and one witness after another testified to the good character of the bench. The audience voted unanimously as the jury to free the bench. When the local officials refused to honor the jury’s verdict, community members used humor to demonstrate the absurdity of imprisoning a bench. They brought dozens of chairs inside the fence to keep the bench company. When city workers removed the chairs, activists created a park scene complete with a birdhouse and mannequins sitting on the bench playing chess. 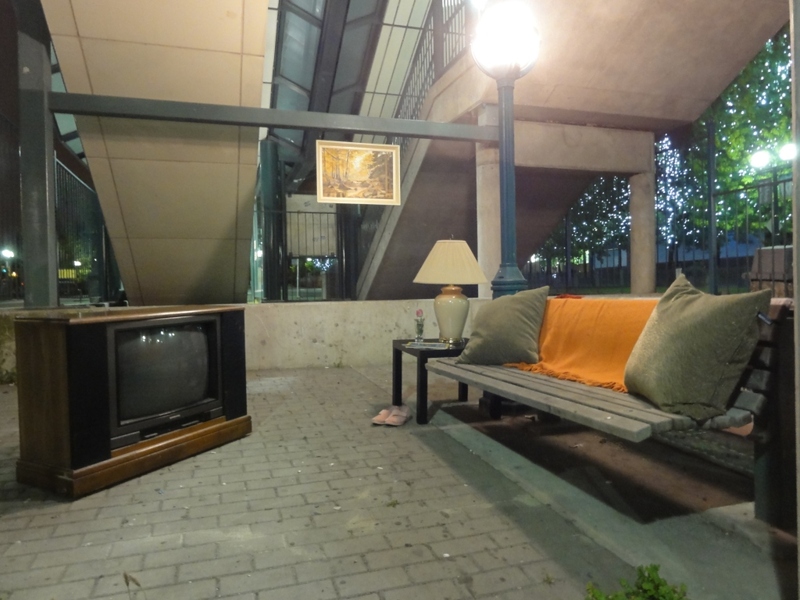 Later, the scene was changed so that the bench resembled a sofa facing a coffee table and television set. More and more people visited the bench to see the ever-changing scene and to have laughs at the City’s expense. One time, artists converted the bench into a dinosaur (benchosaurus). Later, they decorated the space with hundreds of origami cranes and invited visitors to add their own. When it became Christmastime and the bench was still imprisoned, they installed a Christmas tree and a fireplace hung with stockings. Finally, the City relented and announced that the bench would be set free. 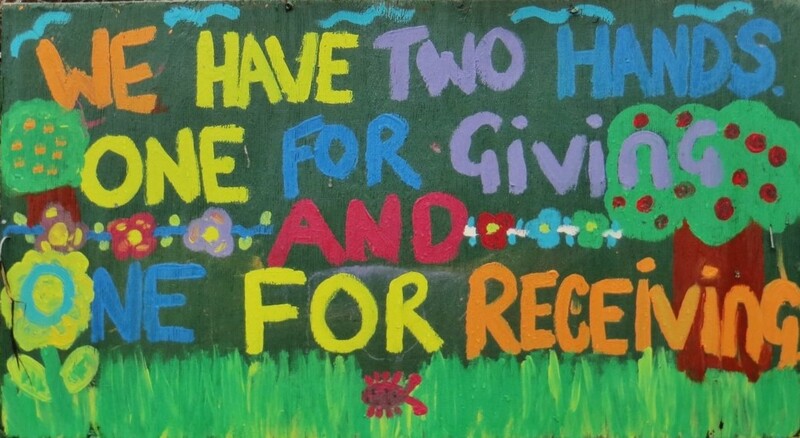 Residents were invited to a celebration where they could paint love messages on the bench. There are now many benches on the plaza next to Surrey’s new city hall. 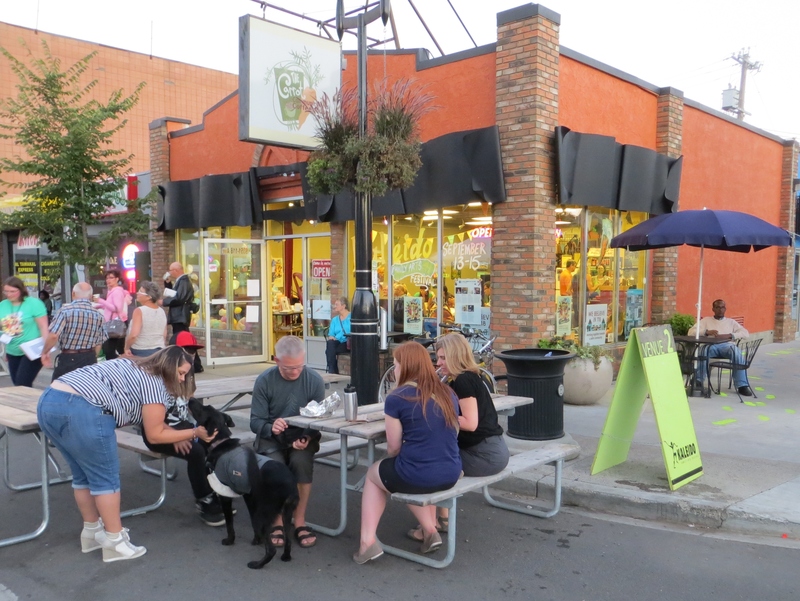 When neighbors became increasingly concerned about the crime that had overtaken the 118th Avenue business district in Edmonton, they didn't spend their time in meetings complaining to the police. Instead, they renovated one of the many boarded up storefronts as the Carrot, a coffee shop operated by the community. Local musicians started playing in the Carrot and artists displayed their works. It wasn't long before the art spilled out of the coffee shop and into the street, and the annual Kaleido Festival was born. A winter festival soon followed and then a farmers market. Now, instead of avoiding 118th Avenue, people from throughout the region are attracted to this vibrant district of multi-ethnic restaurants and unique shops including a beautiful new center for artists with disabilities. In downtown Tacoma, residents were concerned about the increasing number of pedestrian accidents. They organized Citizens for a Safe Tacoma but, rather than holding any meetings, they used their time to paint crosswalks in the middle of the night. The City responded by using grinders to remove the rogue crosswalks. Several days later, however, the crosswalks had been repainted. This time, not only did the City remove the crosswalks but they threatened to prosecute anyone caught painting them. 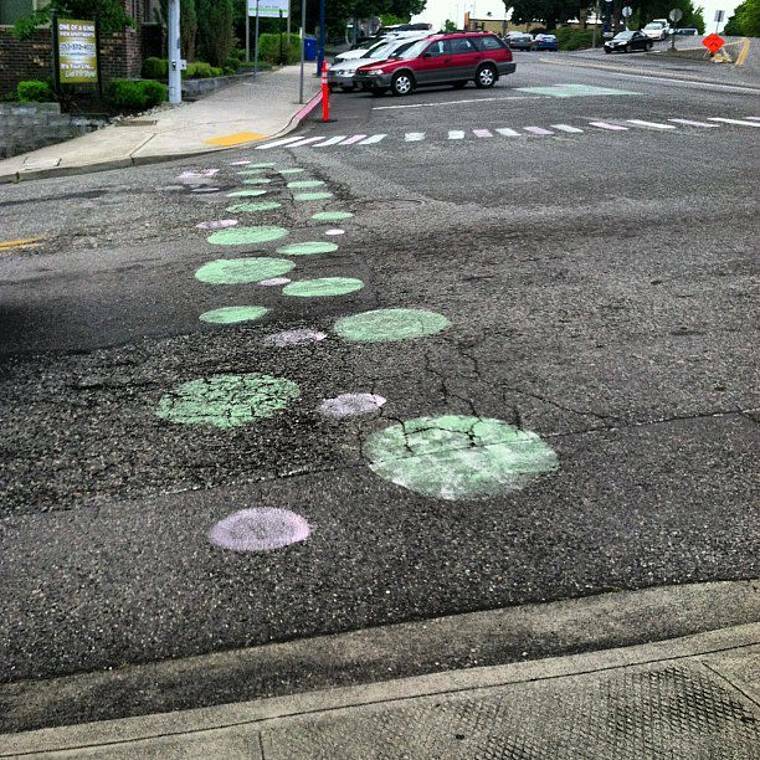 So, the protesters painted polka dots instead of crosswalks. The City Manager finally gave up, organized a forum on what to do about pedestrian safety, and announced that one million dollars would be budgeted for safety improvements downtown. Posted in Uncategorized on July 30, 2015 by admin. Posted in Uncategorized on April 12, 2015 by admin.